The making of a violin is a work of precision, based on ancient proven methods which have remained unchanged for centuries. Classical Cremonese-style models, such as Stradivari and Guarneri, are those most frequently made today. The violin is a wooden instrument which can go out of order, become used or break. It must therefore be frequently checked by a violin maker. Much of our time in the workshop is devoted to upkeep and repairs. The restoration of fine instruments demands not only meticulous care but also respect for the original character of the instrument and broad experience on the part of the violin maker. Preliminary examination makes it possible to detect defects or imperfections and to pinpoint the adjustments necessary, useful or desirable to restore the instrument's sonority and beauty. The cost of repairs is determined in writing and the owner therefore knows in advance the expenditure involved. The time required for the repair can be very short as is the case in rehairing a bow. Appraisal obviously requires a close, leisurely look at the instrument. A verbal appraisal includes a report on the condition of the instrument and its approximate value. A written appraisal details the instrument in its present state, measurements and replacement value. The certificate of authenticity also describes the instrument and identifies its era and maker without necessarily setting a value. An appointment is recommended so that the time necessary for such a consultation may be reserved. 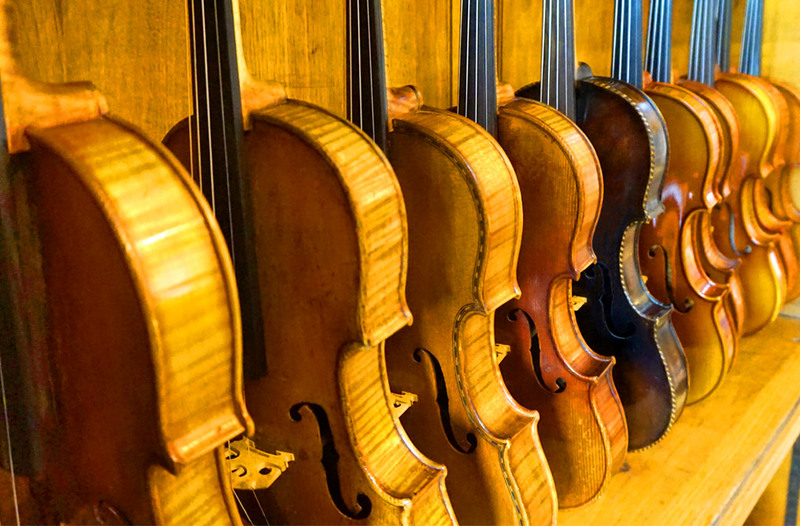 Over the years, many activities have been added to the workshop's undertakings: direct importation from European and Oriental manufacturers; models of study violins especially made according to our specifications; exhibitions of instruments by European violin makers; sales to wholesalers, institutions, stores, etc. Acquisition of the designation certified distributor for major brands of strings and instruments enables us to base our prices on a quality-price ratio better than the average. We ourselves select from international markets the merchandise most likely to meet our clients' needs. We carry a vast number of new and used instruments, at all levels, as well as fine and old instruments. Violin, cello and bass courses are available upon request for those who wish to benefit from our location in downtown Montreal. We can also recommend various recognized professors based on the area of residence of the client. We rent violins, violas, cellos, and basses for short or long-term periods. We would be pleased to provide you with further information. Instruments built on the Stradivari model and according to our own specifications in Korea. Also, European brands such as Dvórak, Höfner and Sandner. Instruments made in Europe by renowned firms such as Ernst Heinrich Roth, Gill, Höfner and Sandner. French, German, Italian or others, from different eras, made by well-known master violin makers. Instruments are also made to order in our workshop with aged and top-quality wood. Our collection of old basses is unique in Quebec. We also sell modern double basses from Czech Republic, Korea and German origin. Collector’s bows, superior quality, German and French. Thomastik, Pirastro, D’Addario, Jargar, Larsen, Corelli. Rosins, shoulder rests, mutes, wolf eliminators, Dampit humidifiers, tuners, metronomes, pickups, music stands, instrument stands, Violustre cleaner and polish. Adjusters, buttons, bridges, pegs, tailpieces, chinrests, endpins, nuts and saddles, fingerboards, bow parts. for violin, viola, cello, double bass, guitar. Spirit and oil-based, gums, glue.